Daniel Yohannes is the United States Ambassador to the Organization for Economic Cooperation and Development (OECD). Born in Addis Ababa, Ambassador Yohannes has worked in banking and economic development for over thirty years. In the following article he reflects on the 2015 Financing for Development Conference held in Addis Ababa last month. Washington, DC — This July, the world came together in Addis Ababa to agree on a financing framework for the sustainable development agenda. It was a key moment that gave new impetus to development cooperation and laid a solid foundation for the adoption of the post-2015 agenda later this year. But the Addis conference was also significant because it signaled a paradigm shift in the way we think about development. 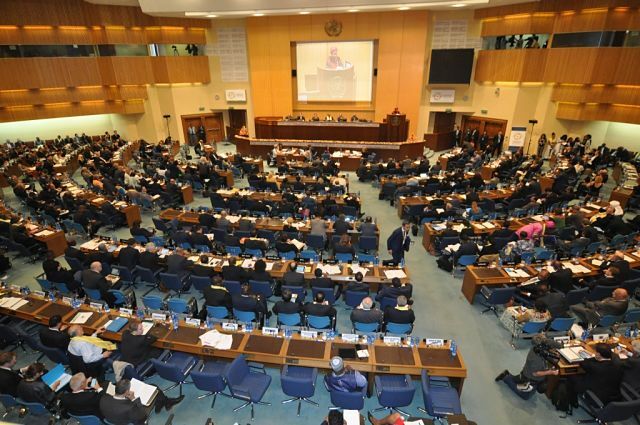 Addis built off of previous Financing for Development conferences but went further in emphasizing that private investment and domestic resource mobilization are just as critical to development cooperation as foreign assistance. Private investment is already dwarfing Official Development Assistance (ODA). Forty years ago, ODA represented 70% of funding from developed to developing countries; today it makes up only 13%. According to the OECD, developing countries attract more than 50% of foreign direct investment worldwide, up from less than 20% in 1990. And there is potential for much, much more. Africa in particular is ripe for additional private investment. Home to seven of the world’s 10 fastest-growing economies, the continent has become the second most attractive investment destination in the world according to the World Bank. But adequate infrastructure is essential to unlocking the full potential of private investment flows and ensuring that resilient global value chains are spread across the continent, rather than concentrated in a few countries. In Addis, the international community agreed, among a number of initiatives, to establish a Global Infrastructure Forum in order to identify and address infrastructure gaps. The United States will support this initiative through the G20′s Working Group on Infrastructure and the OECD’s work on transportation and telecoms infrastructure, as well as through innovative projects such as Power Africa. Announced by President Obama in 2013, Power Africa is mobilizing public and private partners with the aim of doubling electricity access in sub-Saharan Africa. Already, it has succeeded in attracting nearly $32 billion in public and private sector commitments. The U.S. Government’s Millennium Challenge Corporation (MCC) is also leveraging public-private partnerships to expand infrastructure in Africa. During my time as CEO of MCC, I saw first-hand how effective these partnerships are at facilitating trade, attracting investment, and driving economic growth and development. I inaugurated highways paved through MCC partnerships in Ghana and Tanzania that are roadways to regional commerce and a lifeline for farmers and entrepreneurs. MCC’s port expansion project in Benin attracted $256 million in private investment. Its electricity project in Ghana led General Electric to build a $1.5 billion power park. Of course, inadequate infrastructure isn’t the only impediment to private investment. The OECD Policy Framework on Investment, updated this year, reflects the reality that the investment climate is affected by a number of factors, including public governance, ease of doing business, property rights, rule of law, and political stability. Using this tool, the United States is working with the OECD to help a number of African countries improve their investment climates. Just as private investment is necessary to produce economic growth, domestic public resources are needed to ensure that this growth is sustainable and that its benefits are shared broadly across all levels of society. Tax revenues help countries finance their own development and invest in public services such as health care, education and infrastructure. Today, half of sub-Saharan African countries mobilize less than 15% of their GDP in tax revenues, compared to an average of 34% in OECD member countries. That’s why we launched the Addis Tax Initiative, which promises to help developing countries improve tax administration. Donor countries will provide funding and technical assistance to help developing countries broaden their tax bases, develop stronger tax institutions, and redouble efforts to stem tax evasion and avoidance. These efforts can also be supported through greater participation by developing countries in the OECD-led Global Forum on Tax Transparency and Exchange of Information for Tax Purposes (Global Forum). The OECD’s research shows that international cooperation in this area can have a major impact. Thanks to a capacity-building program, Colombia was able to increase its tax revenue from transfer-pricing ten-fold, from $3.3 million in 2011 to over $33 million in 2014. Support from the Global Forum helped South Africa collect $62.3 million through a settlement with one taxpayer. As a member of the Addis Tax Initiative, the United States will be increasing tax support and assistance while doubling the base resources for the Department of Treasury’s Office of Technical Assistance by 2020. To help tackle illicit financial flows, which cost African economies billions of dollars each year, we will also be stepping up the Partnership on Illicit Finance, announced by President Obama last year at the U.S.-Africa Leaders Summit. Of course, ODA remains a precious resource, particularly for Least Developed Countries and fragile states. The United States is proud to be the world’s top contributor of ODA, with nearly $33 billion committed in 2014. But what Addis recognized is that assistance is most powerful when it is used as a transformative tool — one that can catalyze investment and support domestic resource mobilization. While much progress has been made since the first Financing for Development conference in 2002, we still have a long way to go towards eradicating extreme poverty and ensuring that economic growth everywhere is inclusive and sustainable. What is clear is that we will need to maximize all three sources of development finance — assistance, investment and domestic resources — if we are to meet the challenges ahead. This article was originally published in Jeune Afrique.